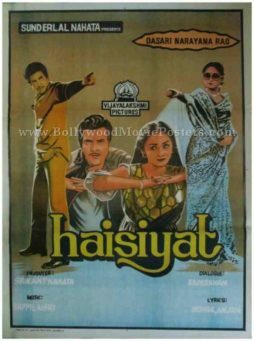 Hand drawn movie poster for sale of the classic Hindi film Haisiyat (1984). This is an actual surviving hand painted Bollywood poster for sale of the 1984 Hindi film that starred Jeetendra, Jaya Prada and Pran in prominent roles. Printed and circulated during the original first release run of the film (somewhere in the early 1980s), this hand drawn movie poster for sale was designed for publicity of the film but never ended up being used. 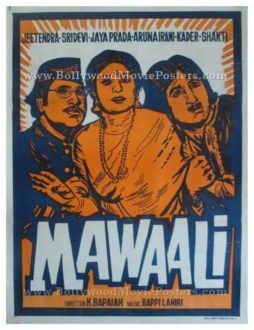 This old Hindi movie poster was originally hand painted on canvas by a leading poster design studio. 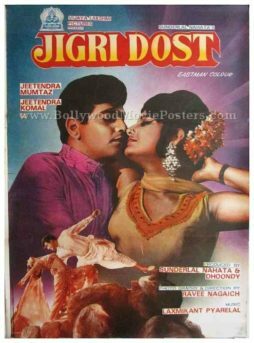 Fabulous hand drawn portraits of the lead couple Jeetendra and Jaya Prada are seen in this old Hindi movie poster. 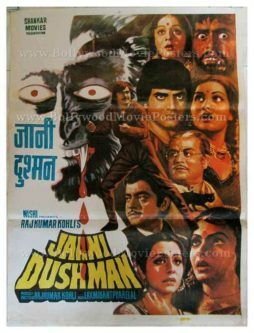 Two symmetrical hand drawn portraits of the lead actors are seen flanking either side of this old Hindi movie poster for sale. 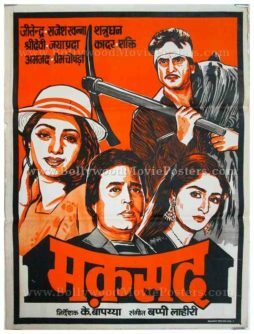 Vintage Bollywood poster of the Hindi film Karmayogi (1978) for sale. 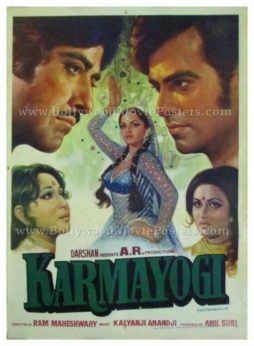 This is an actual surviving vintage Indian film poster of the 1978 Bollywood movie Karmayogi that starred Raaj Kumar, Jeetendra, Mala Sinha and Rekha in lead roles. 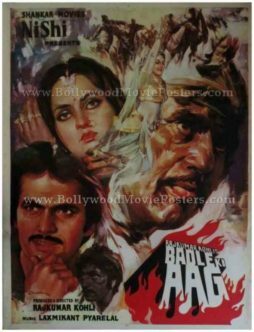 Printed and circulated during the first release run of the film (late 1970s), this vintage Hindi film poster was originally designed for publicity of the film but never ended up being used. This vintage Bollywood poster for sale features stunning hand painted artwork. Originally designed on canvas by one of the greatest Bollywood poster artists of his time, DR Bhosle, this vintage Indian film poster features his printed signature on the top left hand corner. 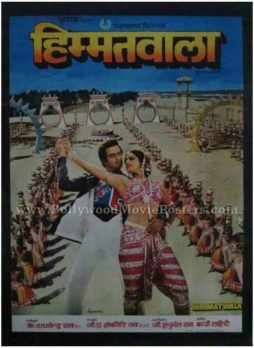 True to noted Bollywood poster painter DR Bhosle’s mastery, a superbly hand painted portrait of actress Rekha in a dancing pose is seen on the center of the poster. 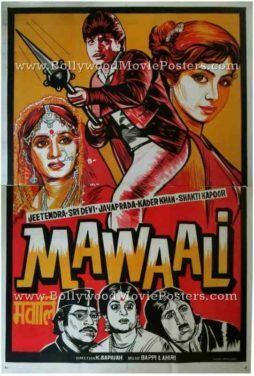 Large close up hand painted portraits of actors Raaj Kumar and Jeetendra are seen on either side on the top of the poster, while smaller close ups of Mala Sinha and Reena Roy appear at the bottom. 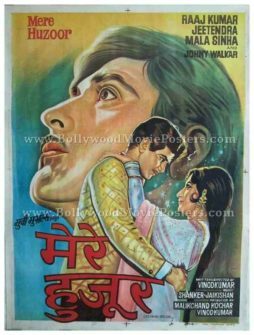 Old Bollywood movie poster of the romantic Hindi film, Mere Huzoor (1968) for sale. 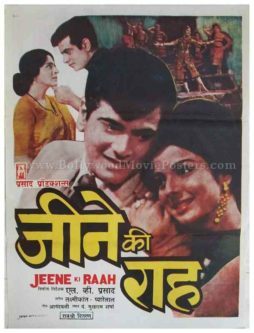 This is an actual surviving original vintage Bollywood movie poster of the 1968 Hindi film that featured Raaj Kumar, Jeetendra and actress Mala Sinha in lead roles. 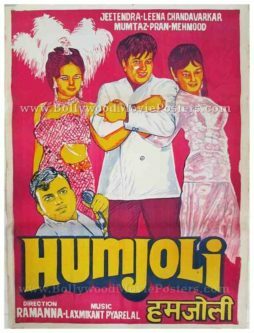 This old Bollywood movie poster was originally hand painted on canvas by a leading poster design studio in Bombay. A stunning side profile portrait of actor Raaj Kumar is seen prominently on the poster. 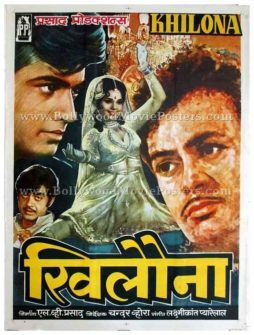 A smaller hand painted portrait of Jeetendra and Mala Sinha locked in a passionate gaze is seen at the bottom of this old Bollywood poster. Mere Huzoor featured music by legendary composers Shankar-Jaikishan and lyrics by Hasrat Jaipuri. The film is fondly remembered for its ghazal, “Rukh Se Zara Naqab Utha Do Mere Huzoor” sung by Mohammed Rafi and the award winning classical dance number, “Jhanak Jhanak Tori Baje Payaliya” sung by Manna Dey. 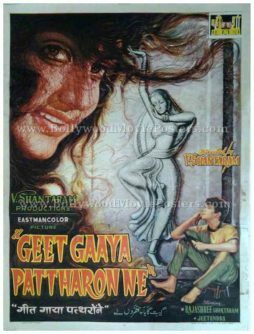 Very rare original old Bollywood poster of the V. Shantaram Hindi film, Geet Gaaya Patharon Ne (1963) for sale. This is an actual surviving vintage Bollywood poster of the 1963 classic produced and directed by V. Shantaram. 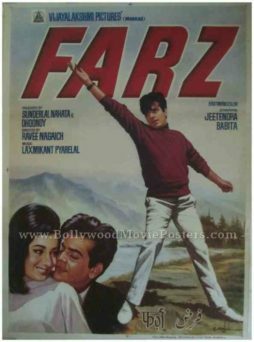 Geet Gaaya Patharon Ne starred the “Jumping Jack” of Bollywood, Jeetendra alongside V. Shantaram’s daughter Rajshree in the lead role. 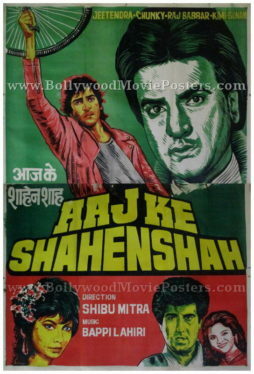 The film marked the Bollywood debut of Jeetendra, making this poster highly collectible. Printed and circulated somewhere in the early 1960s, this old Bollywood poster was originally designed for publicity of the film but never ended up being used. 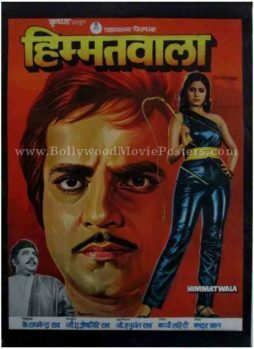 This artistic hand painted Bollywood poster features a stunning close up of lead actress Rajshree Shantaram, while a smaller portrait of Jeetendra is seen at the bottom. A sculpture appears at the center of the poster. Quirky, hand painted old Hindi film poster of the blockbuster Bollywood movie Himmatwala (1983) for sale. 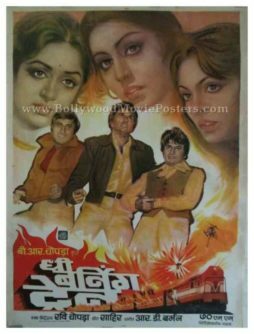 This is an actual surviving old poster of the 1983 Hindi film that catapulted actress Sridevi into Bollywood stardom. 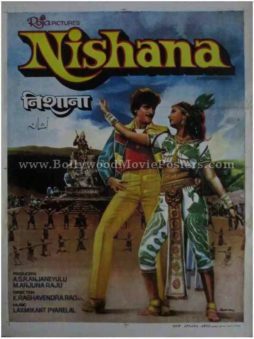 Printed and circulated a few years after the first release of the film, this old Hindi film poster was originally designed for publicity of the film but never ended up being used. The poster features a large, quirky hand drawn portrait of Sridevi dancing, surrounded by a wave of musical notes. Lead actor Jeetendra is shown alongside on the left in blue, while Amjad Khan is depicted at the bottom. The entire poster is designed and printed in two colors, i.e. red and blue, adding greatly to its quirk quotient. 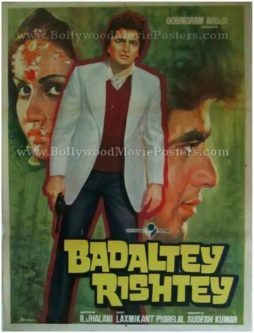 The typography used in this poster is primarily English, with the title translated in Devanagari Hindi as well. 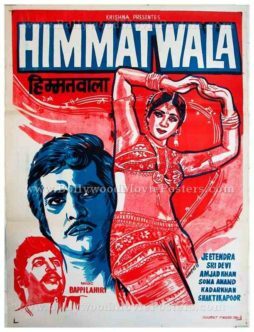 Himmatwala (The Brave) is a 1983 action Hindi film starring Jeetendra and Sridevi.The film is credited with turning actress Sridevi into a star in Hindi cinema. The film was the highest grosser of the year it was released in and declared a blockbuster. 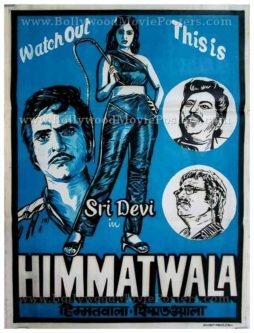 Quirky, hand drawn old Bollywood poster of the blockbuster Hindi film Himmatwala (1983) for sale. This is an actual surviving vintage poster of the 1983 film that catapulted actress Sridevi into Bollywood stardom. Printed and circulated a few years after the first release of the film, this hand painted vintage Bollywood poster was originally designed for publicity of the film but never ended up being used. This Bollywood poster was originally designed on a hand painted canvas by a small time art studio in Kolkata, making it very collectable. The poster features a large, quirky hand drawn portrait of Sridevi holding a whip in her hand. Lead actor Jeetendra is shown alongside on the left with the two supporting characters encased in circles on the right. The entire poster is designed and printed in a single color, i.e. blue, adding greatly to its quirk quotient. Capitalizing on Sridevi’s entry into stardom, the poster announces the same on the top in English. 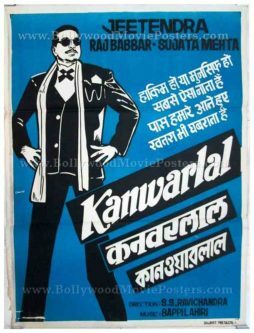 The typography used in this poster is primarily English, with the title translated both in Devanagari Hindi as well as Bengali at the bottom.